Is it better to blend in or stand out? You can do both when sporting one of my favorite fall trends that has been continuing into spring: I’m loving the camouflage fashion trend. What used to be considered “hunting attire” is actually a pretty hot look with lots of versatility. Stay with me and I’ll show you how to wear camo. You can, I promise. Camouflage is good in small quantities. You will definitely look like you’re ready for a weekend in the mountains if you try and pull off too many pieces at once! Opt for a cute camouflage tee with feminine details paired with skinny jeans and converse sneakers. Top a pair of camo pants with a striped top, or even add a pair of feminine camouflage-print flats to black skinny jeans and a chunky grey sweater. These options all have a splash of the trend but don’t overdo it. 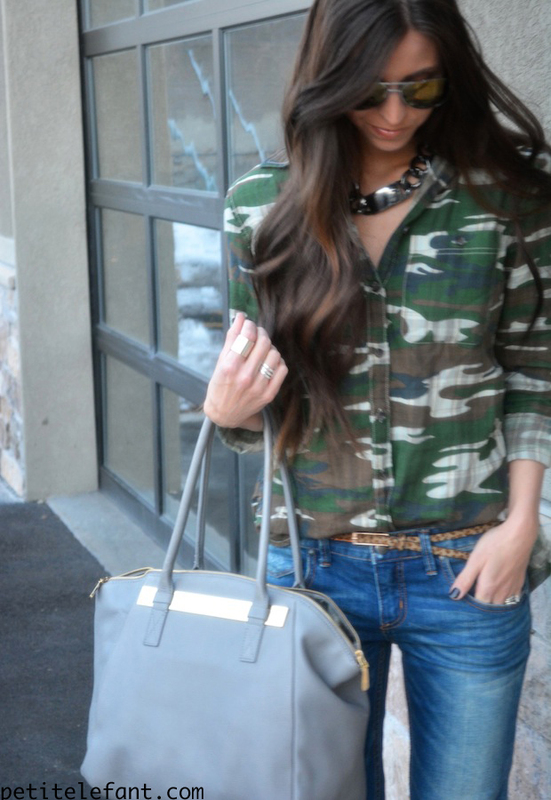 You can also go with a fun button down camo shirt with boyfriend jeans and booties similar to my look here. The rolled cuffs and chunky necklace keep the look fresh. Watch for slightly feminine fits and avoid anything too boxy. Another great thing to consider when considering how to wear camouflage is that it’s a print that can work as a neutral Similar to leopard print, you can pair other prints with it easily without it looking too gaudy and over the top. Stripes (not too big) and polka dots (also not too large) are perfect options for print mixing when it comes to camo! A perfect casual, comfy look for a day of running errands or lunch with the girls! Now that you know how to wear camouflage, I hope you’ll give it a go. Gorgeous! I love adding a piece of camouflage to my outfits, as well. I have a pair of camo skinny jeans that I like pairing with plain tops and heels. I leave a comment whenever I especially enjoy a post on a blog or I have something to contribute to the conversation. It is triggered by the sincerness communicated in the post I looked at. And after this post %BLOG_TITLE%. I was moved enough to leave a comment :-) I actually do have 2 questions for you if you usually do not mind. Is it just me or does it look as if like some of these responses appear like they are written by brain dead people? :-P And, if you are posting at additional online social sites, I’d like to follow you. Would you list the complete urls of your communal sites like your Facebook page, twitter feed, or linkedin profile?